Although off their highs, U.S. farmland values have held up remarkably well. This post discusses rental rates & farm economics in the context of the farmland. Although off their highs, U.S. farmland values have held up remarkably well. A continuation of a very low-interest rate environment along with a strong cash rental market appear to have been some of the factors that have made the strongest contribution to this trend. I discussed some of these trends at the recent DTN Ag Summit. You can download my slides here. This and a subsequent post will provide a summary of my comments. The first discusses rental rates and farm economics in the context of the farmland market and the subsequent post will examine farmland valuations. It is important to understand that our perspective on the land market is driven by a belief that the farmland market is ultimately driven by economic decisions. While people may cite a number of reasons to justify farmland purchases, in the long-run we believe that economic decisions dominate. In other words, expectations of future farmland earnings and opportunity costs (interest rates) are the primary drivers. As a result, those are the factors upon which we focus most of our attention. The biggest challenge with this view is that expectations can, and do, change rapidly. This being said, let’s take a look at some of the economic fundamentals in the farmland market. It is no secret that commodity prices and farm incomes have fallen from the highs seen in the early 2010’s. Although fertilizer prices have fallen and farmers have reduced capital expenditures, farm budgets remain tight. One of the factors that have contributed to these tight budgets is stubbornly high cash rental rates. This is not to say that rents haven’t adjusted at all. Figure 1 shows that annual percentage change in cash rental rates for average quality Indiana farmland. Figure 1. 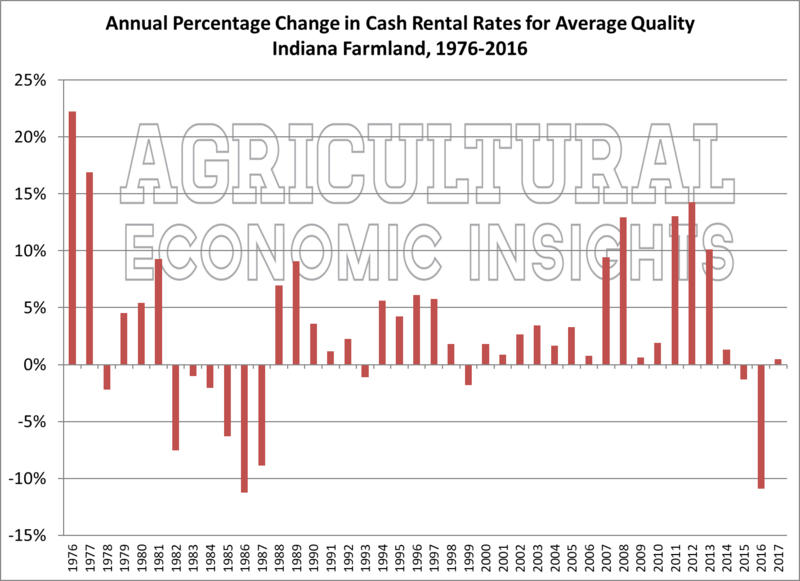 Annual Percentage Change in Cash Rental Rates for Average Quality Indiana Farmland, 1976-2017. We can see from Figure 1 that 2016 produced a substantial (-11%) decline. This was preceded by a slight decline in 2015. However, the declines ended in 2017 when rents edged up slightly. We have discussed this chart numerous times in the past, and the lessons remain the same. First, rent declines are not all that common. Second, although not all that common, during times of financial distress rents can fall by a significant amount. At this point, it appears that the conditions have not been unfavorable enough to trigger even bigger declines in cash rents. Figure 2 shows that cash rental rate measured in dollars per bushel of expected production. This was constructed by dividing cash rent by the expected production on average quality Indiana farmland. It has not been adjusted for inflation but has been adjusted for changing yields. One can see that today’s rental rate of $1.27 per bushel of expected production is well off its 2013 high of $1.53 per bushel. So rents have come down, but it remains an open question of whether the decline is sufficient to account for commodity price declines. Figure 2. Cash Rent Rate per Bushel for Average Quality Indiana Farmland, 1976-2017. To examine this issue a bit further we calculated the budgeted expected return to farmland before cash rent. This measure subtracts all budgeted costs except land rent from budgeted returns. We then normalize it by dividing by cash rent. So a value of 100% means that the farmer would expect to pay all of their costs and be left with 100% of their cash rent. Values over 100% result in a budgeted economic profit, whereas values below 100% represent a budgeted economic loss. These values are shown for average quality Indiana farmland in figure 3. Figure 3. Expected Return to Farmland as a Percent of Cash Rent, Average Quality Indiana Farmland 1991-2017. In 2017, the expected return to farmland as a percent of cash rent was 14% and unchanged from 2016. This means that at budget time, farmers expected to generate enough returns to pay all of their costs and only 14% of their cash rents. It is obvious that this value is very low in the context of the data since 1991. However, it is not unusual for this value to fall below 100%. The average over the time period shown is 72%. This means that in order to pay all their costs, farmers must produce yields or commodity prices better than budget or have better cost control than budget. If not, the cash payments to rent must come from reduced spending in other areas, most likely capital equipment replacement. I often say that if things go according to budget, farmers can expect to pay for either their land or their equipment, but not both. One has to question how long such a situation can persist. The tight budgets facing farmers for the last 4 years have taken a toll on farm financial conditions. We have discussed this in numerous posts (1, 2, 3), in the last year. Perhaps the most striking figure that we have shown illustrates how the working capital in the farm sector has dropped. Figure 4 shows working capital in the farm sector from 2012 to 2017. Figure 4. Working Capital in the U.S. Ag Sector, 2012-2017f. Due to ERS’s update, the chart differs from the one in the previous post and the slide deck. In particular, ERS increased its estimate of the working capital in the farm sector by $17 billion dollars from February 2017 to November 2017. This is a large increase and projected improvement, but the general conditions and conclusion that would be drawn don’t change significantly. The amount of working capital in the sector has dropped sharply. In short, farmers do not have the liquid financial reserves that they had in previous years. This will likely reduce farmer willingness/capacity to purchase additional farmland from existing cash reserves. The decline in farm sector liquid cash reserves is mirrored by a reduction in longer-term borrowing capacity in the sector. The debt service ratio is shown in Figure 5. The debt service ratio indicates the proportion of the value of farm production that is used to meet principal and interest payments. Today, 27% of the value of farm production is consumed by principal and interest payments. This ratio has clearly been higher in the past, but the times in which it was higher were generally characterized by difficult financial times in agriculture. While it is most definitely true that one can only learn so much about financial conditions by looking at aggregate data, the trends are not heading in a direction that would suggest farm financial conditions are improving. In short, one wonders how much additional borrowing capacity lies in the farm sector. As finances become tighter is will likely make it more difficult for farmers to purchase farmland. Figure 5. Debt Service Ratio, U.S. Agriculture, 1970-2017f. When examining farmland values, it makes sense to begin by looking at cash rental rates and farm economic and financial conditions. Cash rental rates have seen some declines, but one must wonder whether more are in store. Under recent budgets, expected income is not sufficient to pay cash rental rates and all other costs. The means that farmers are most likely subsidizing rental rates through reduced spending on capital expenditures and working capital erosion. Of course, higher yields and better price can help ease this situation, but the aggregate data suggest that in aggregate farmers have not had such an experience. Combined with continuing pressure for lower cash rents, farm financial conditions have deteriorated in the last 4 years. This has likely reduced the capacity of the sector to purchase farmland. Overall, the factors discussed in this post don’t paint a favorable picture for farmland value increases. However, rents have remained relatively high. As long as rents continue to hold at high levels, farmland prices will remain supported. Given crop budgets and financial conditions, one must wonder how long rents can remain at levels that don’t appear to be economically profitable. To answer the question posed in the title “What’s supporting farmland values?” the data here suggest it’s unlikely to be current farm economic and financial conditions. Perhaps it is expectations of better times ahead. However, it is also likely a function of the low-interest rate environment. We will discuss this in another post when we examine farmland valuations in more detail.